Bishop Louis Green, who leads The Fuller Center Western Cape, South Africa, got a boost this week from a few exchange students from the University of Connecticut. Libby Didomizio, Mary McNelly, and Molly Miller donated several hours of their time Monday to help build the new house in Bonteheuwel for a needy family, working alongside Bishop Green and other volunteers. “The three students did an excellent job building a new entrance at the door, fixing the outside lamps, and improving the kitchen and bathroom walls for the needy family,” Bishop Green reported. Bishop Green also said The Fuller Center Western Cape has instituted a Skills Training Program for at-risk youth. 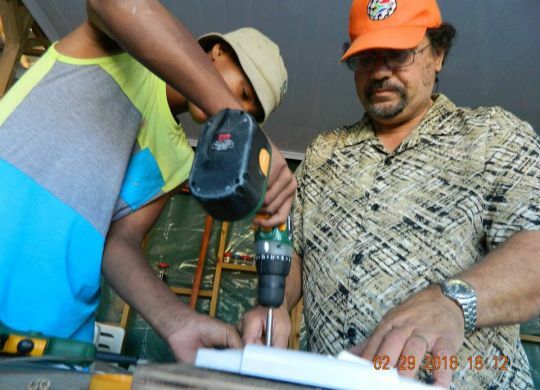 “In our program, we teach basic skills like woodwork, roof construction, house designs, masonry, building with fiber cement, electrical house wiring, plumbing, tiling, painting, interior decorating, and landscaping,” he said. We enjoyed our volunteers from Uconn, USA, Libby, Mary and Molly.